The Daily Log is an optional form used to list daily assignments that can be used for states mandating an end-of-the-year portfolio or log. To use the Daily Log, list the page numbers completed in each subject each day, an overview of the objectives accomplished for that day, and any extra-curricular activities accomplished, including field trips. This form can take the place of your student's Daily Assignment and Goal Charts and is an excellent log to present to superintendents and other officials. Each student should have their own Daily Log. 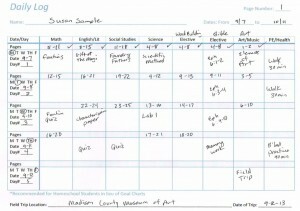 Middle school and high school students should keep their own Daily Log as a means of reviewing their lessons each day.